On Boxing Day, I decided to join a group ride that was hosted by Jeff Bowman. This is his third year hosting one and this time he decided to lead us to Salvation Mountain via Box Canyon Road. There were 10 of us, 7 Victory, 2 Harley and one Honda (me). 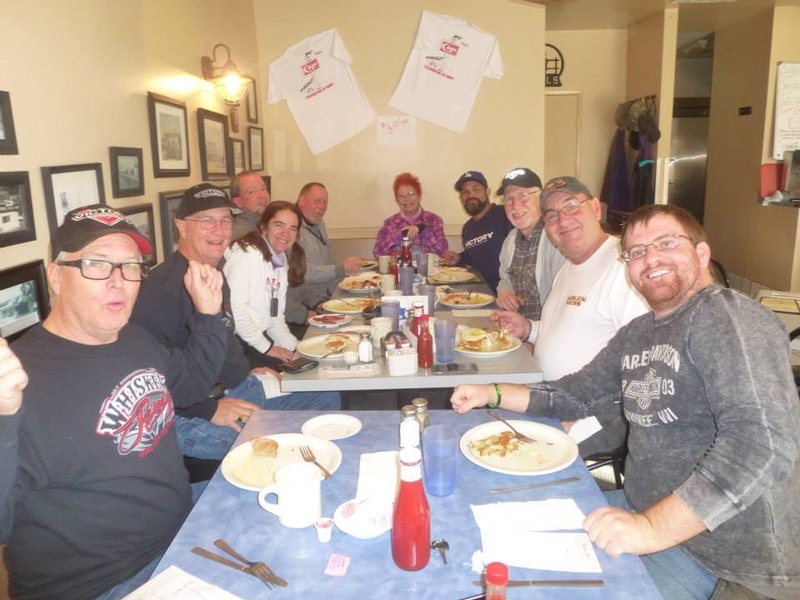 We all met at Morongo Cafe in Morongo Valley at 8 am. To make it on time, I had to leave at 6 am and it was only 24 degree. Sigh, it was going to be a brutal ride. I layered up as much as I could but I still had to stop 3 times to warm up my fingertips. However, with all of my gears, I was still warm enough everywhere else on my body. I need to find a solution for keeping the fingertips warm. I thought that I was furthest rider but I discovered that I was not, one guy has ridden all the way from Culver City, CA. Salvation Mountain is in Niland, California and reside right in front of Slab City. 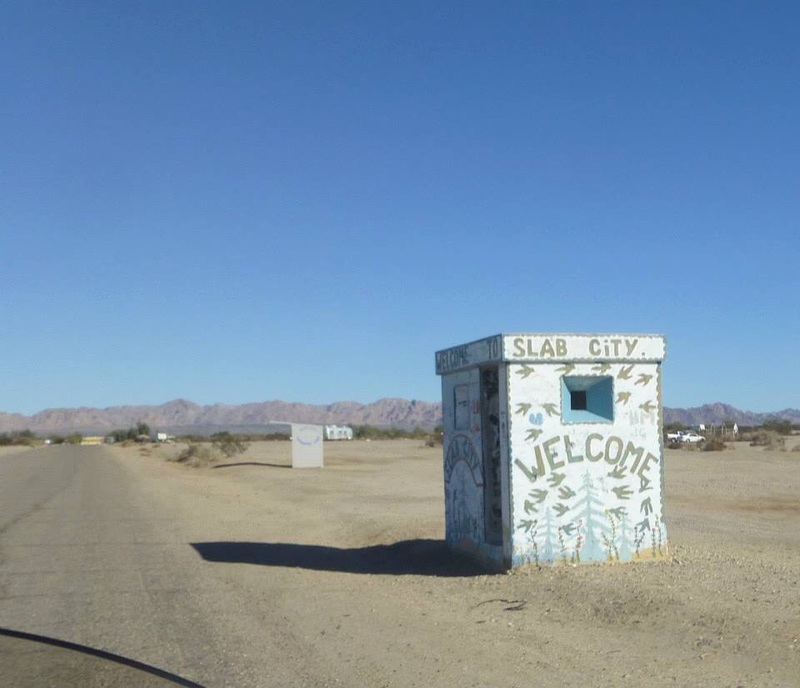 Slab City is an old WWII Marine barrack of Camp Dunlap which was decommissioned and torn down in 1956. Only the slab of the barrack remained hence the name. Now it is the home of the snow birds and squatters. During the winter times, the population swell up to several thousand residents and during the summer months, it only host about 150 permanent residents. 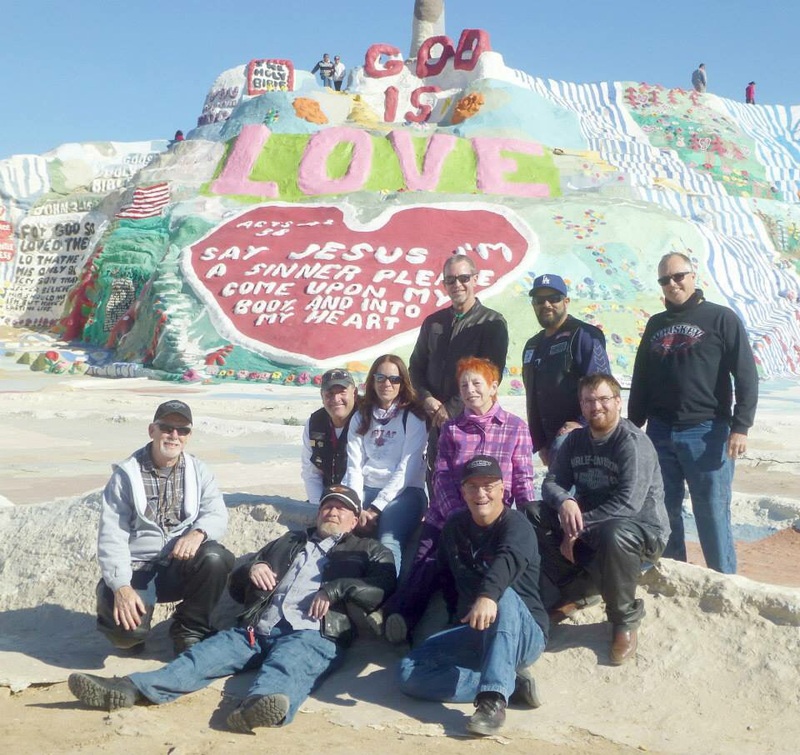 Salvation Mountain is hillside attraction about three-story high made out of concrete, straw bale and adobe covered entirely in acrylic paints and bible verses. It was started by Leonard Knights in 1984 after several failed attempt to build a hot air balloon to spread the word about Jesus and Sinner’s prayer. He ended up in Slab City for work on repairing tires. He actually fell in love with the area and decided to transplant to spread his message here. The mountain you see here in this picture is not his first attempt at it. The original mountain collapsed into a heap due to weak concrete structure. However, he was not deterred and began building once again which is still standing today. Sadly, Leonard passed away last year at the age of 83 but his legacy still lives on thanks to donation of visitors and volunteers who maintain the place. All in all, it was a great group ride but one of the down fall of riding with a group, you can’t make random stops. I had made a mental note to come back out this week to do some sight-seeing on my own. Such as the Salton Sea which has a colorful history how the lake came to be. There was also a historical site on the road we turned on to head into Salvation Mountain, I saw a sign about a historical site but I can’t find any information on the internet about it. Hmmm, note to myself, alway be prepared and carry a camera to take a pictures for reference later on. Also further down near Jacumba, there is a Desert View Tower that I want to check out. I’ll add it to my list of places to check out for the next time I’m down there. Thank you Russ…I love the freedom and peace that a motorcycle gives you.